Have you ever looked at a quilt and wished you could make one but find it overwhelming? 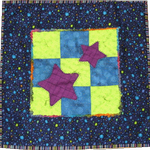 This class will teach you how to make a very small quilt from beginning to end. We will cover fabric choices, cutting, piecing, pressing, appliqué, borders, tying, machine and hand quilting, binding, rod pockets and labels. With your finished mini quilt, you will have the knowledge to tackle something larger. With just 5 fat quarters you can make your wall hanging whatever theme you like!